The NEW FIT PRO Glove, all Sports design, features a durable non-synthetic ultra suede leather construction. These non grip gloves are perfect for all sports disciplines that do not require grip such as a taped lyra/hoop, lifting, cross fit, hand balancing, trapeze, etc. You are ensured a comfortable and effective grip for all sporting conditions. Providing you with the perfect fit and overall luxury. Performance Velcro Tab Closure for an Easy Fit. Provide a great grip and an optimal mix of feel and durability. PLEASE MEASURE AROUND THE ENTIRE HAND. 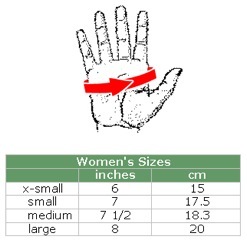 Measure your dominant hand with a tape measure around the knuckles of your hand (as shown in picture below). Our gloves should be tight fitting! To prevent the gloves from slipping against the skin of your hands, apply a small amount of Mighty Grip to the palms of your hand before putting the gloves on.